This cheesy flatbread comes together quickly thanks to an easy pizza dough recipe and tons of cheese. It’s versatile and delicious! You all remember Mac and Cheese Mania? Welll I’ve teamed up with one of my favorite clients — United Dairy Industry of Michigan* to bring you a similar challenge but this time we’re talking Flatbread! I’m kicking if off with a basic flatbread dough recipe that can get pizza or flatbread on your table in probably an hour. If you’re organized. Maybe an hour and fifteen minutes if you have two toddlers. The dough starts with yeast (duh), olive oil, honey, and water. All the essentials to a good pizza dough. And then you add in your flour, of course. And then…I added cheese. Because, cheese. Can’t ever go wrong with cheese. I used an extra sharp white cheddar — pick a good quality cheese. It will be well worth it in the end. Once you have the pizza dough mixed up and kneaded, it only needs to rise for about 30 minutes! One of the best parts of this recipe is that it makes enough for two flatbread crusts. Great for serving a crowd, or great for saving for another day! 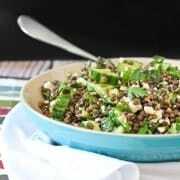 It stores terrifically in the fridge for a couple days or for a month or so in the freezer. Even the easiest yeast bread such as this pizza requires a little bit of work. I firmly believe in always making extra. That way you only have to do the work once but you get to reap the benefits twice! It’s a wonderful thing. I roll out this dough on an olive oil coated countertop. I know, whaaaaat? No flour? It’s my personal preference because I like a little olive oil on my pizza crust anyways so you’re killing two birds with one stone here. Pour about a teaspoon of oil straight onto your counter, rub it around so the surface is well coated. And make sure to throw a little on your rolling pin as well, for good measure. This will keep your dough from sticking but it also tastes great. Win-win. Of course, if you’re more comfortable with flour, that will work wonderfully as well. Now let’s talk toppings. This dough is ready for anything you throw at it, but I went with a basic cheesy bread. Who doesn’t love cheese bread? I always order some type of cheese bread when we get pizza. It’s the best part! The great part about this cheesy flatbread is that it is versatile (I love things that are versatile, obviously). Cut it into sticks and have cheesy breadsticks with that pasta or salad. 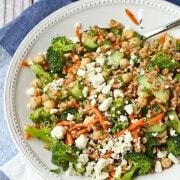 Cut it into larger portions, pair with a vegetable or salad and you have dinner! Kids would be on cloud nine, right? Or…here’s an idea. Cut it into really small pieces and use as croutons on a great soup like this creamy tomato soup. I could go for that combo right about now. In the bowl of a stand mixer (fitted with a dough hook), combine water, yeast, oil, and honey. Add 3 cups of flour and the salt and mix with the mixer on low. With the mixer on medium-low, slowly add the last cup of flour as need to form a smooth dough that pulls away from the edges of the bowl. Continue to knead for 8 minutes. (You can also do this by hand but it might take closer to 10 minutes for a smooth dough to form.) During the last 30 seconds to one minute, add in cheese and continue to knead until combined. Pour about a teaspoon of olive oil into a large bowl and rub so the bowl is coated. Transfer dough into bowl and flip over so that the dough is coated with oil. Cover with plastic wrap and place in a warm place for 30 minutes or until about double in size. Divide dough in half. If you don’t plan to use it all right away, store tightly wrapped in the fridge for a couple days or freezer. On a lightly oiled or floured surface, roll out dough to desired thickness. Place on a oiled baking sheet add toppings and bake at 450 degrees Fahrenheit for 10-12 minutes or until golden brown. 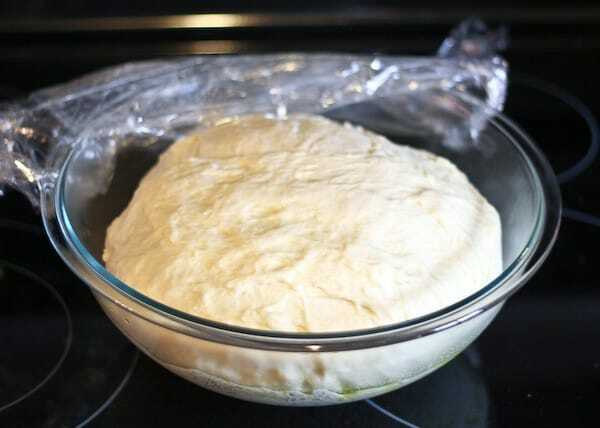 Roll out pizza dough to 11×17 and place in an oiled or sprayed pan. Melt butter and mix with garlic powder. Brush this evenly over flatbread dough. Top with cheeses and dried oregano. Bake for 10 minutes or until golden brown. Note: Dough can be frozen or refrigerated. 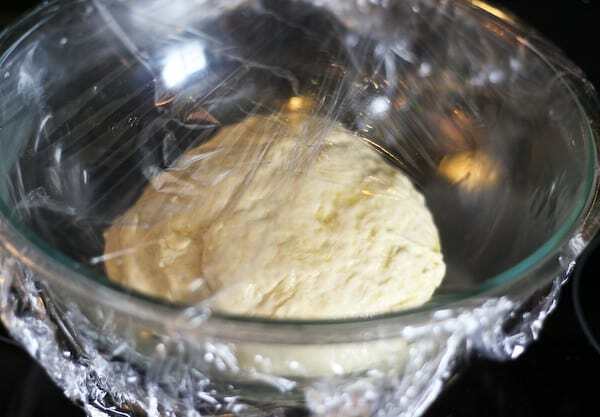 To thaw frozen dough, place in refrigerator overnight. To use chilled dough, leave at room temperature for 20 minutes prior to use. Now, let’s talk about the FABULOUS FLATBREAD CHALLENGE! Yay! It will work the same way as mac & cheese mania – link up your favorite flatbread recipe (you can add up to 4 links!) and then use the giveaway widget to complete your entry. There are step by step directions below — follow those and you’ll be good to good. What’s up for grabs?! 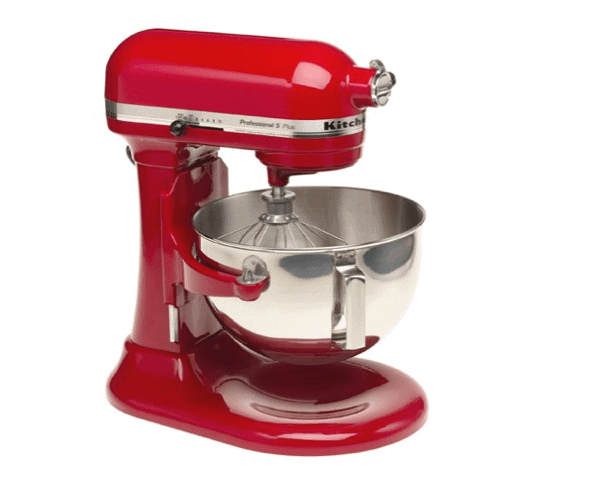 One winner will win the lovely KitchenAid (also a Michigan company!) 5-quart professional mixer pictured below — in the color of your choice! And then there are three more prize packages which consist of a pizza stone, a pizza cutter, and a ceramic mixing bowl. That’s four prizes total! If you’re in need of some flatbread inspiration, I gathered up some of my favorite food bloggers to help me kick off this event! And what they created is making me SO hungry. I’ll also be bringing you a couple more recipes this week so check back for those! Find a flatbread or pizza recipe on your blog or create a newly developed recipe — you have two weeks! (If it is an older post, make sure to follow step #2 and you MUST still link back.) If you don’t have a blog — read step #4! Recipes MUST contain a cow’s milk dairy ingredient and may NOT include any other type of dairy (no goat’s milk cheeses) or any dairy substitutes. Add your link to the Fabulous Flatbread inlinkz link-up widget on my site. Then, use the giveaway widget to confirm you entered and also earn extra entries. You must enter one to be eligible to win but you may enter up to 4 flatbread or pizza recipes. If you don’t have a blog — you are still eligible to win these awesome prizes! Leave your recipe or link to your favorite flatbread or pizza recipe in the comment section of my site during the link-up (ends October 24th, 2014) and tell us why you love it. Then, use the giveaway widget to complete your entry. PLEASE NOTE: If you do not use the giveaway widget to complete your entry — you will not be eligible to win prizes. Be patient — it might all take a minute to load. Good luck! Can’t wait to see your recipe! If you have any questions — you know how to contact me. Link-up will be open through October 27th, 2014 at 11:59pm EST. Four (4) winners will be announced that week. All winners will be selected randomly and will be notified via email. They will have 48 hours to respond. All giveaways open to US residents over the age of 18. *Disclosure: I am thrilled to be in an ongoing partnership with United Dairy Industry of Michigan. I have been compensated by UDIM for my time to develop this recipe and organize the Fabulous Flatbread Challenge. All opinions are as always, my own. Find out more about why Milk Means More on Twitter, Facebook, YouTube and Pinterest. Cut up boneless, skinless chicken breast into bite size pieces and saute in garlic olive oil. While that’s cooling, mix together granulated garlic with ranch dressing. Spread dressing on cooked flat bread (I used store bought naan that looked more like flat bread than any naan I’ve ever seen), sprinkle with cooked chicken, diced jalapeno, diced tomato, and cover with shredded cheddar cheese. Top with bacon bits and bake at 400 until cheese is melted and slightly browned. I’m already craving it just a few days later. 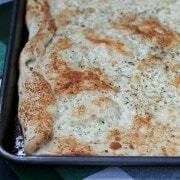 Pingback: Caramelized Onion & Roasted Garlic Flatbread | Katie Serbinski - M.S., R.D. My regular recipe for many years….after seeing your post I may be changing to flatbread! Just came across this post- I can’t wait to join the challenge!!! 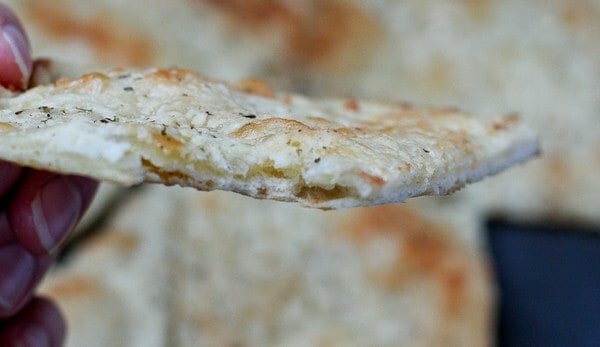 I never think to make flatbread… love this simple recipe! Now that I’ve made this, it’s my new favorite !!! What a great contest!! In my heart I know I need to accept this challenge… now to just summon up the courage to do it. Beautiful flatbread has always eluded me in the past! I am a carb junkie! So bread is just yummy. Period. But I also love sweet, so pear and onion on bread is just something I could eat all the time! I like putting kind of strange things together like that and trying it, you just never know. Agreed, nothing goes better with pizza than cheese bread! Imagine my shock the other night when we ordered pizza from a new place and…no cheese bread. WHAT? Could have used this beauty! 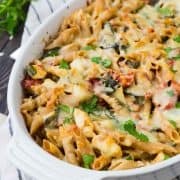 I’ve made this recipe many times with success–I hope it counts! How fun! 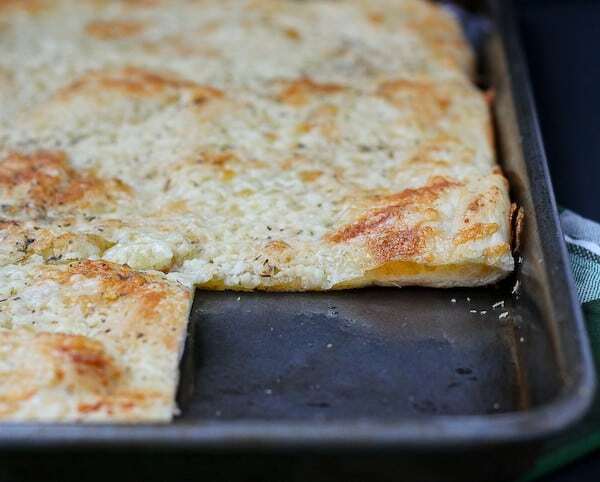 You cannot go wrong with a cheesy flatbread…this looks delish! Oh man, fabulous indeed!! This looks awesome! This is a delicious flatbread. I love anything with caramelized onions. This is a delicious flatbread! I love anything with caramelized onions. You can never go wrong with a simple, cheesy flatbread. I LOVE that you put cheese in the dough, as well as on top! Seriously, This girl knows how to do pizza!! I love adding lots of cheese! Sometime I even add lots of veggies and ranch instead of traditional sauce! Yummo!! I love this simple, but awesome-sounding flatbread. Cheesy flatbread is ALWAYS a good idea!! This cheesy flatbread is right up my alley! Thanks for organizing this delicious event! 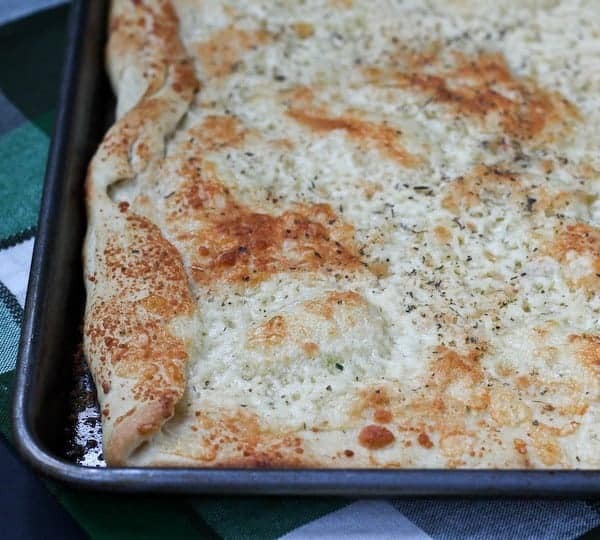 So excited to be part of this Flatbread challenge, your cheesy flatbread looks delish! Woohoo!! Cheers to cheesy flatbread goodness!! My kids would LOVE this! !